I was going to do a Wordless Wednesday post with this picture but I think that it deserves an explanation. Today was Fall Party Day at the kids school. We got costumes ready last night, everything laid out. Very exciting. When Alice got out of bed, I thought she felt a bit warm but I chalked it up to being warm and snugly in her bed (or denial, you choose). While I was brushing her hair she mentioned that her ankles hurt from standing too long. I felt her forehead and indeed she was running a temp. She has all the flu symptoms, fever, cough, stomach ache….oh man. Not today, please not today! I guess the flu doesn’t stop for Halloween parties. 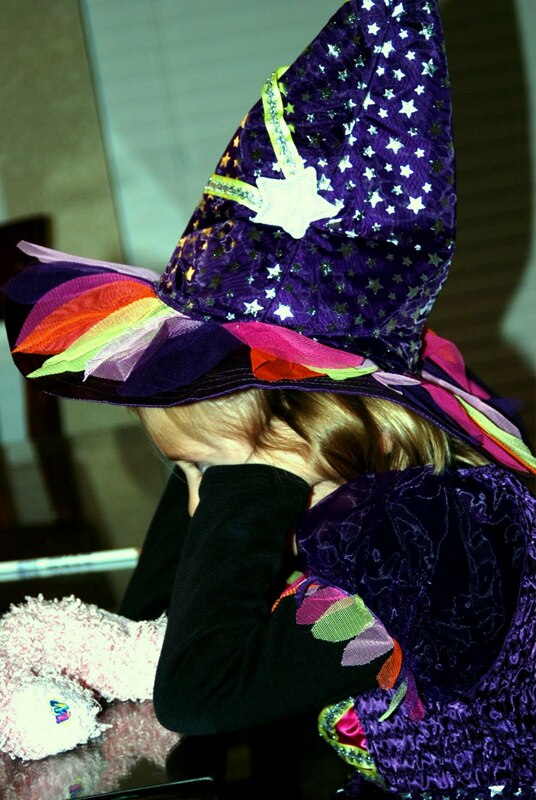 She looked so cute in her costume, even if she was sick. On the brighter side, we get to wear our jammies all day, again. Well, Mason and I anyway. Paige is wearing a princess dress (her daily outfit) and Alice is still dressed in her witch costume, hoping for a miracle. Another positive for this day, Alice lost ANOTHER tooth at breakfast. Now she is officially wishing for her two front teeth for Christmas. Adorable. When she is feeling better I will snap a toothless grin. Finally, here is a pic of Sam as he headed out this morning. Shaggy and Scooby Doo. Definitely not a Wordless Wednesday. Sorry to hear you are sick Alice. The witch outfit looks great. Hope you feel better and can go trick or treat. We are waiting to see the toothless grin!! 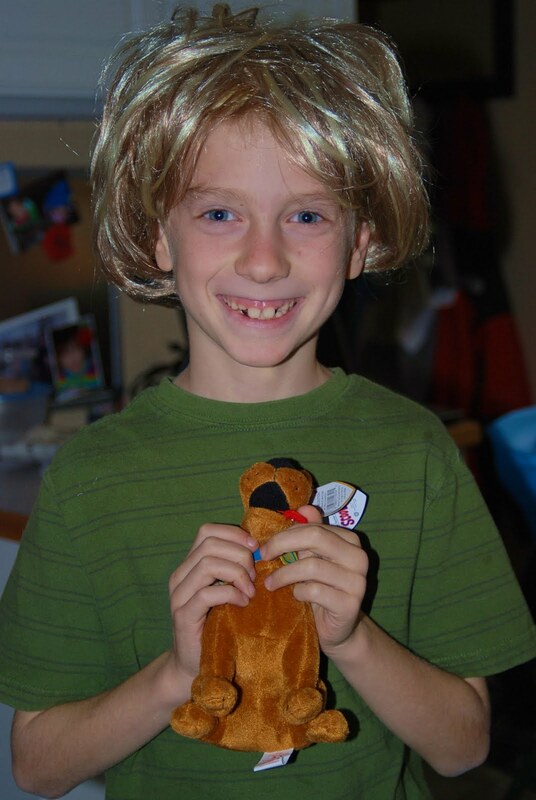 Sam you look a lot like the Scooby Doo guy with the new hairdo. Pretty clever. A big “HI” to all and Princess Paige and Mason we love you too! Shaggy looks so cute, and so does the witch. Hope she's feeling better! (Benjamin's Scooby Doo, he and Sam'd look pretty funny next to each other!) Hope you have a good Friday.